The subject of the present invention is a finishing compound having acoustic properties and comprising, in percentage by weight relative to the total weight of the product, at least - 25 to 80% of water; - 0.1 to 5% of thickener; - 0.01 to 0.8% of dispersant; 10 to 60% of monogranular filler, the D50 of which is greater than or equal to 100 µm; - 0.5 to 6% of binder; and that does not comprise a foaming agent; and that has an air permeability after evaporation of the water between 800 and 6000 mks Rayls. The present invention relates to a finishing compound having acoustic properties. Coated finish, also called plaster decoration or finishing or decorative coatings are generally used to coat a carrier to give it the desired finish matching aesthetic criteria. But when we want to decorate or improve aesthetics supports having acoustic properties, it is necessary to use specific finishing compounds that will not disrupt or alter the acoustic properties of their supports. In particular it should not plug the porosity of the media, having acoustic properties. In other words, all finishing coatings are not suitable if you want to preserve the acoustic properties of the medium on which they are applied. Particularly in the case of absorbent acoustic panels used to make false ceilings, it is necessary to use specific finishing coating. To meet the industrial requirements it has become necessary to find a finish coat with improved acoustic properties. - 0.5 to 6% binder; and not comprising a foaming agent. The present invention also provides a topcoat comprising the product described above. The present invention also relates to a plaster plate on which is applied the finishing coating according to the invention. Finally, the present invention relates to the use of a finish coat according to the invention for the manufacture of elements for the field of construction. The invention offers significant advantages, in particular the product according to the invention preserves the acoustic properties of the medium on which it is applied. Advantageously, the product according to the invention can be used as topcoat for any type of ceiling panels, and in particular plasterboard ceiling. The invention offers the further advantage that the product according to the invention can be used either for its acoustic properties and / or aesthetic properties. Another advantage of the invention is that the coating has a high water content, which ensures good handling of the coating, and facilitates application of the coating at the site. Another advantage of the present invention is that the product according to the invention can be applied in a single layer, that is to say that the application of a single product layer of the invention is sufficient to obtain the acoustic properties and / or the necessary aesthetic properties. Furthermore, the product according to the invention has the advantage that it has a great covering or lining, which will hide the joints made with a grout. So quite advantageous, the product according to the invention is suitable as a finish coating for monolithic ceiling. By monolithic ceiling is meant within the meaning of the invention, a ceiling composed of a single element. For example it may be a ceiling comprising a plurality of plasterboard secured by a seal and covered with a finish coat, all having a monolithic appearance, i.e. consists of a single element. Finally, the invention has the advantage that it can be implemented in all industries, especially the construction industry and in all construction markets (building, civil engineering or prefabrication factory) in the components industry for the field of construction, plaster products for the construction industry. Other advantages and features of the invention will become apparent from reading the description and examples given purely illustrative and not limiting that follow. - the ability to reduce or eliminate the reverberation of sound waves, or the ability to think at least the sound waves. By "binding" means the present invention any compound having the property to bring cohesion to the formulation in which it is incorporated. This binder is intended to bind inert elements such as fibers or granular fillers. By the term "antifoaming agent" means according to the present invention any compound having the property of preventing or avoiding the formation of the dispersion of a gaseous phase in a liquid, semiliquid, semisolid or a solid, in particular to prevent or avoid the formation of a mouse. By "wetting agent" is meant according to the present invention any compound having the property of modifying the surface tension of a liquid to promote dispersion of the fibers or to prevent the fiber flocculate. By the term "thickener" means according to the present invention any compound enabling or facilitating the maintenance in equilibrium of heterogeneous physical phase. By "gum" means according to the invention plant exudates or extracellular secretion of microbiological origin. (Volume percent based on the size) with only one peak (one population). This definition of "mono-load" excluded a mixture of different sized particles or excluded granular stack of several different sized particles. Preferably, the product according to the invention does not contain fine fillers. By the term "fine fillers" means according to the invention therefore the median particle diameter D 50 is strictly less than 100 .mu.m. The expression elements for the field of construction means according to the present invention any component of a structure such as a floor, a yoke, a foundation, a wall, a partition, a ceiling, a beam, worktop, a pillar, a bridge pier, a concrete block, a pipe, a post, a cornice, a road element (for example a curb), a tile. - 0.01 to 0.8% dispersing agent; 10 to 60% mono-load which D 50 is greater than or equal to 100 microns; - 0.5 to 6% binder; and not comprising a foaming agent. Preferably the product according to the invention, after drying, is a porous product or permeable to air. Preferably the product according to the invention, after evaporation of water, is a porous product or permeable to air. 70%, more preferably from 35 to 60%, even more preferably from 40 to 50% weight percent based on the total weight of the product. Water suitable according to the invention may be tap water. According to a variant of the invention, the product may comprise from 0.001 to 10% of antifoaming agent, preferably from 0.1 to 5% of antifoaming agent, weight percent based on the total weight of the product. The product according to the invention comprises 0.1 to 5% thickening agent, preferably from 0.5 to 2.5% thickening agent, more preferably still from 0.5 to 1, 5% agent thickener, by weight percentage based on the total weight of the product. Thickening agents suitable according to the invention are preferably gums, cellulose and its derivatives such as cellulose ethers or carboxymethyl cellulose, starch and its derivatives, gelatin, agar, carrageenans. Preferably the product according to the invention comprises gum as a thickening agent. Gums as a thickener suitable according to the invention are preferably chosen from Acacia gum, Tragacanth, Locust Bean, Dextran, diutan, gellan, guar, scleroglucan, xanthan, welan. The preferred gum according to the invention as a thickening agent is xanthan gum. The product according to the invention comprises from 0.01 to 0.8% dispersing agent, preferably 0.1 to 0.5% dispersant, more preferably 0.1 to 0.25%, percentage weight relative to the total weight of the product. The product according to the invention comprises 10 to 60% of mono-particle filler which D 50 is greater than or equal to 100 .mu.m, particularly 20 to 55% of mono-particle filler, preferably from 30 to 50% of mono-charged, more preferably 35 to 50%, and finally more preferably 40 to 45%, a percentage by weight relative to the total weight of the product. The monogranular fillers suitable according to the invention are preferably calcium carbonate, dolomite (calcium magnesium carbonate), silica, talc, mica, sulphate anhydrous or dihydrated calcium, barium sulphate or a mixture thereof. 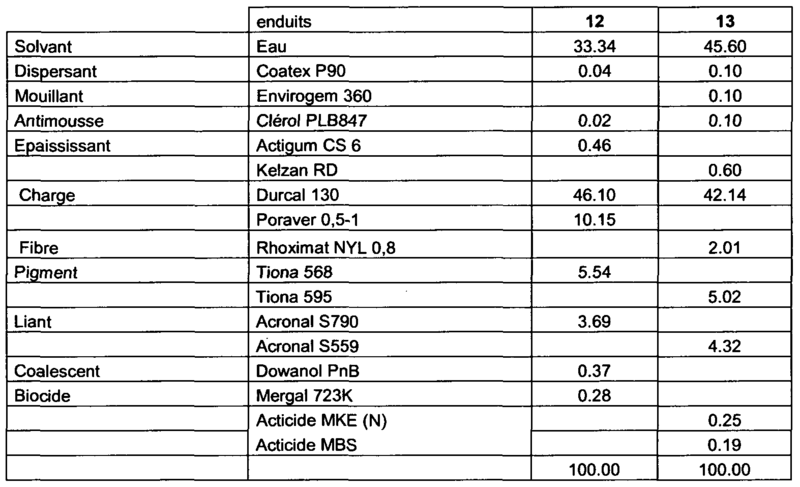 According to a variant of the invention the monogranular fillers suitable according to the invention can be a mixture of calcium carbonate and glass beads, it being understood that the percentage of glass beads is less than or equal to 14%, by weight percent based on the total weight of the product. According to another variant of the invention the monogranular fillers suitable according to the invention do not comprise glass beads. Preferably, the monogranular fillers suitable according to the invention are calcium carbonate as monogranular filler. More particularly, calcium carbonate suitable according to the invention has a D 50 greater than or equal to 100 microns, preferably between 100 .mu.m and 2 mm, more preferably between 110 .mu.m and 500 .mu.m, more preferably between 120 .mu.m and 250 .mu.m. Finally, the preferred calcium carbonate according to the invention has a D 50 equal to 200 microns. these values ​​being measured by laser diffraction, preferably using a type granulometer Malvern MS2000 apparatus dry. The product according to the invention may further comprise from 0.1 to 5% of synthetic or animal fibers, preferably from 1 to 3% of synthetic or animal fibers, weight percent based on the total weight of the product. Synthetic fibers suitable according to the invention may be polyamide fibers, polypropylene fibers, polyester fibers, polyacrylonitrile fibers. Preferred fibers according to the invention are synthetic fibers, especially polyamide fibers. Preferably, the product according to the invention contains no vegetable fibers. The product according to the invention comprises 0.5 to 6% binder, preferably from 1, 0 to 5% binder, more preferably 1, 5 to 4%, more preferably 1.5 to 2%, percentage weight relative to the total weight of the product. The binder ensures cohesion of the product according to the invention. The binder suitable according to the invention may be an acrylic polymer, a styrene acrylic, a vinyl polymer, a mixture thereof and their derivatives. The preferred binder of the invention is an acrylic polymer, especially a styrene acrylic polymer. The product according to the invention may further comprise additional additives, for example wetting agents, coalescents, leveling agents, bactericidal agents, fungicidal agents, heavy solvents, pigments, pigment photocatalytic. According to a variant of the invention, the product may further comprise from 0.05 to 1% wetting agent. Wetting agents suitable according to the invention are preferably alcohols, polyols and in particular diols. According to another variant of the invention, the product may further comprise from 0.01 to 5% of coalescing agent. Coalescing agents suitable according to the invention are preferably glycol ethers. The product according to the invention may further comprise a heavy solvent. heavy solvans suitable according to the invention are preferably hexylene glycol or butylene carbonate. According to another variant of the invention, the product may further comprise one or more pigments alone or in admixture. Pigments suitable according to the invention are preferably titanium dioxide. The product according to the invention may further comprise one or photocatalytic pigments. Among photocatalytic pigments suitable according to the invention include the photocatalytic titanium dioxide. Preferably, the product according to the invention does not comprise clay. Preferably, the product according to the invention does not include zinc pyrithione. The product according to the invention can be achieved by mixing with water in a mixer successively the various constituents of the product. The product according to the invention can be applied in one single application. This means it is not necessary to apply several layers of the product according to the invention to obtain a satisfactory result. It should be noted that said result is satisfactory when the amount of product according to the invention on a carrier is between 0.7 and 3.5 kg / m 2. The product according to the invention an amount of only 1 product after application on a carrier comprised between 0.7 and 3.5 kg / m 2, preferably between 1 0 and 3.0 kg / m 2, more preferably between 1, 0 and 2.5 kg / m 2, still more preferably between 1, 5 and 2.0 kg / m 2. The product according to the invention has the advantage that it can be applied by various methods such as the method of application to the knife, the method of application to the roller, the spray application method. Among these methods, the preferred application method is by spraying method, particularly the method of application to the lance to project or from a large spray unit volume low pressure or from a device said "airless". When the product is applied to the holder by a layer called application layer, the thickness of said layer is between 0.5 mm and 2 mm, preferably between 0.7 mm and 1, 5 mm, more more preferably between 0.8 mm and 1.3 mm. The product according to the invention after evaporation of the water a greater air flow resistance of 800 mks Rayls (Ns m "3), preferably between 800 to 6000 mks Rayls, preferably between 950 to 5000 mks Rayls, more preferably between 1000 and 3500 mks Rayls measured according to ASTM C522-87. After application to the medium, the product is preferably allowed to dry at room temperature. After drying, the product according to the invention is preferably a porous product or permeable to air. By air-permeable is meant a product having a higher air flow resistance of 800 mks Rayls (Ns m "3), preferably between 800 to 6000 mks Rayls, even more preferably between 1000 and 3500 mks Rayls measured according to ASTM C522-87. the present invention also relates to a finishing mortar object comprising the product according to the invention as described above. The finish coat according to the invention is preferably a porous or air permeable coating. By air-permeable is meant a coating having a higher air flow resistance of 800 mks Rayls (Ns m "3), preferably between 800 to 6000 mks Rayls, preferably between 950 and 5000 mks Rayls, more preferably between 1000 and 3500 mks Rayls measured according to ASTM C522-87. The finish coat according to the invention is preferably a coating which does not change the acoustic properties of said support on which it is applied. The finish coat according to the invention is preferably a coating does not alter the air permeability of the medium on which it is applied. The coating according to the invention can be used either for its acoustic property and / or aesthetic properties. The compound according to the invention can be applied to many substrates, including for example a floor, a wall, a partition, a ceiling, a beam, a work plan, a ledge, and whatever the type of support material . The present invention also relates to a gypsum-based panel, in particular a gypsum board, onto which is applied the finishing coating according to the invention as described above. Finally, the present invention also relates to the use of a finish coat according to the invention for the manufacture of elements for the field of construction. 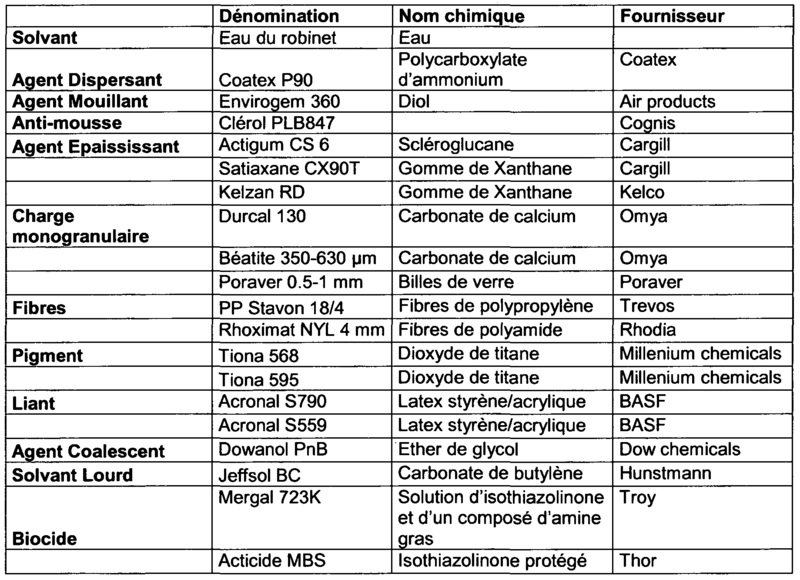 The reagents used in the various formulations of the product according to the invention are collated in Table I below. - Laboratory Mixer Dissolver Rayneri equipped with a light dispersion. - Mixer model turbodisperser Argon AI7.5 equipped with a mark of variable speed mixer shaft Zanelli. - Lance for projecting: Trademark 6P pattern projection assembly Europro consists of a machine with a hopper in stainless steel piece and an induction motor coupled to a reduction gear, resulting in a volumetric screw pump, associated with a compressor and a lance projecting equipped with a 3 mm diameter nozzle. In the bowl mixer, 43.49 parts of tap water are introduced. With stirring at 400 rev / min, 0.13 parts of dispersing agent Coatex P90, 0.11 part of EnviroGem 360 wetting agent, 0.02 part of antifoam Clerol PLB847 and 0.63 part of a thickening agent Actigum CS6 are successively introduced and 5 minutes. The agitation is gradually increased to 2500 rev / min while adding 45.01 parts of filler Durcal mono-130, 5.00 parts of titanium dioxide pigment Tiona 595 2.00 fiber portions Rhoximat NYL 0.8 in 20 minutes. The stirring was decreased to 1000 rev / min while adding 3.00 parts of binder Acronal S790, 0.31 part of coalescing agent Dowanol PNB and 0.31 part of biocide Mergal 723K in 3 minutes. 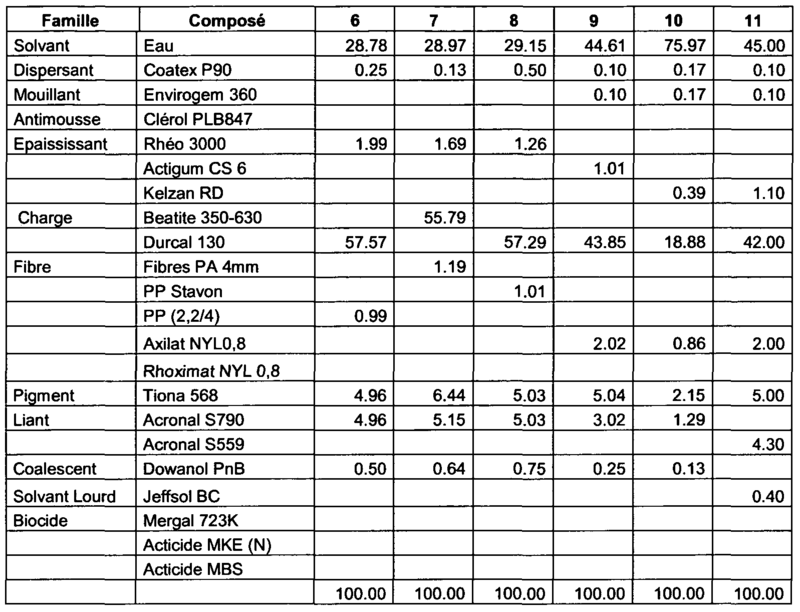 The amounts of components are given in weight percent based on the total weight of the product. Different coatings according to the invention were carried, coated 2 to 13, according to the procedure of Example 1 described above. 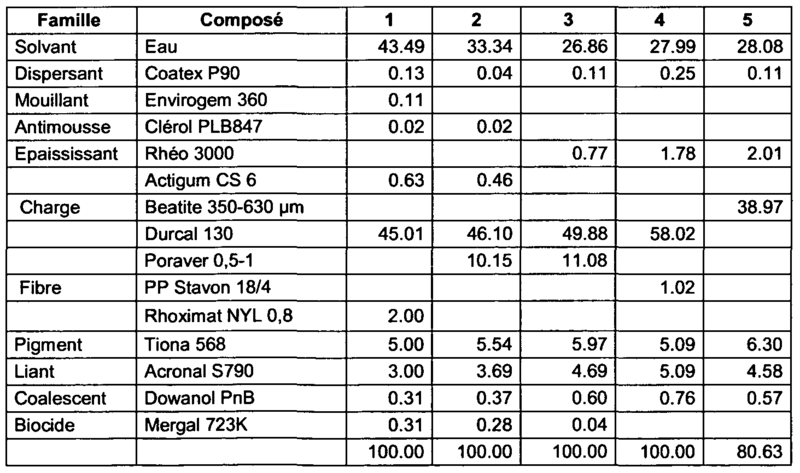 Table II below describes the chemical composition of coatings 1 to 8 and Table III describes the chemical composition of the coatings 9 to 15 in weight percent based on the total weight of the product. The air permeability is estimated from a measurement of resistivity in air. These measurements are made with a commonly known resistivity ohmmeter. The difference in pressure in inches of water is measured for an air flow of 17% between the sample and a glass plate through a witness impression of 5 cm in diameter. Each time five steps corresponding to 5 different values ​​of air flow are achieved. The higher the value obtained, the more they resist the passage of air, the sample will be less porous and less permeable. Coatings 1-11 of the invention are permeable to air. Trial acoustic measurements: The coatings 12 and 13 were applied to gypsum board having acoustic properties. These coatings were applied using a lance projecting (pump speed: 2.5 and atomization pressure: 30 psi). The whole system is named. The method of measuring the noise reduction coefficient (NRC) is the method described in ASTM C423-02A, using a room having a volume of 114m3. Acoustic measurements were performed on these systems. The coatings 12 and 13 are permeable to air, and little or no change the acoustic properties of the medium on which they are applied. Indeed, when the uncoated gypsum board has a NRC of 0.55, the same plate coated with the coating 12 (system) has an NRC of 0.55. Similarly, when the uncoated gypsum board has a NRC of 0.80, the same plate coated with the coating 13 (system) has an NRC of 0.75. 2. Product according to claim 1 characterized in that it further comprises from 0.001 to 10% of defoamer. 3. Product according to claim 1 characterized in that it comprises 0.5 to 1, 5% thickening agent. 4. Product according to claim 1 characterized in that it has an air permeability after evaporation of water, from 800 to 6000 mks Rayls. 6. Product according to claim 1 characterizedin that it comprises from 35 to 50% of mono-particle filler. 7. Product according to claim 1 characterized in that it comprises calcium carbonate as monogranular filler which D 50 is between 100 .mu.m and 2 mm. 8. Product according to claim 1 characterized in that it further comprises from 0.1 to 5% of synthetic fibers. 9. Product according to claim 1 characterized in that it has a quantity of product after one single application in a media comprised between 0.7 and 3.5 kg / m 2. 10. Product according to claim 1 characterized in that it further comprises one or photocatalytic pigments. 11. Topcoat comprising a product according to one of claims 1 to 10. 12. Coating finish according to claim 11 characterized in that it is a coating permeable to air. 13. Topcoat according to claim 12 characterized in that it is a coating which does not change the air permeability of the medium on which it is applied. 14. Panel gypsum having applied the finishing plaster according to claims 11 to 13. 15. Use of a finish coat according to claims 11 to 13 for the manufacture of elements for the field of construction.